Chef has opened a new fast food chain - McHefs. He engaged the best logo designers of country to build a cool 3D logo for the new restaurants. Later he realised that he can't print 3D logo on menu, neon signboard, website etc. So he has asked you to make a 2D version of the 3D logo. You will be using a 320px × 240px (columns × lines) canvas to produce the 2D logo. 1) They may be tilted in any direction. 2) They have a solid colour. There are 9 colours numbered from 1 to 9. 3) They are allowed to intersect. Notice the "jaggies"(jagged edges) in image; they are unavoidable hence acceptable in solution. Note that +Z axis is coming out. 2. 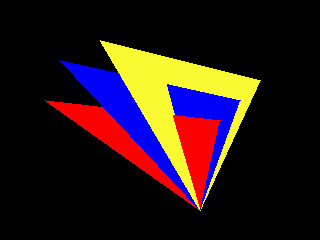 The edges of triangle or quadrilateral should be as accurate as if drawn by Bresenham's algorithm. Note that you don't have to implement Bresenham's algorithm, any approach which doesn't suffers from floating point error is acceptable. Also when rounding off X or Y whose decimal part is exactly 0.5, you have to round up. Like 21.5 becomes 22. 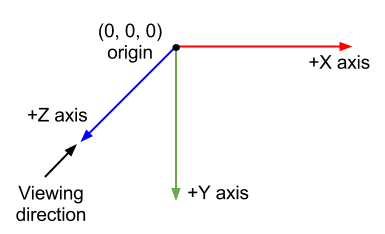 First line contains N, the number of polygons (triangles and quadrilaterals). Then N lines follow, each consists of T the type of polygon, C the color of polygon and 3D coordinates of polygon <X, Y, Z>. When T is 1, the polygon is Triangle and 3 coordinates are given for the triangle's vertices. When T is 2, the polygon is Quadrilateral and 4 coordinates are given for the quadrilateral's vertices. 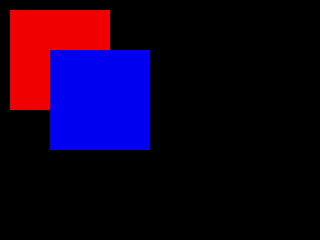 assuming color '0' is black, color '1' is red, color '2' is blue.